Jenna of LynB Designs has been very busy! In addition to her Let's Be Frank, Part 2 Collection launching this Friday, she is also releasing her Infinity War Trio inspired by the upcoming Avengers movie. I had the pleasure of swatching them and sharing them with you today. Let's check them out! I really love this type of moody purple, although I am kicking myself for not realizing it was a thermal polish until after swatching and removing it. It was definitely cold in my house when I was swatching, and I thought I maybe saw a hint of grey with the first coat, but I was rushed and didn't give it a second thought. Oops! I did like this colour and will have to wear it again soon; this time I'll have to play with the thermal abilities! As for the formula, it applies really nicely to the nails and I had no issues with the flakies or glitters clumping or making the polish difficult to apply. Perfectly Balanced was the main reason I was quick to swatch To Infinity: this polish is just so pretty and I couldn't wait to wear it and enjoy it! Not only is the colour fabulous, the formula is divine! Even with all the UCC flakes, the formula is still beautifully creamy and applies like a dream! I haven't been wearing red polishes a lot recently, other than the occasional swatch, but I did have to wear and enjoy Assemble for awhile! I particularly love the flashes of gold from the glass flecks against the red; it's such a great combination! The formula was easy to work with and I didn't find it to be too thin or thick for my liking. 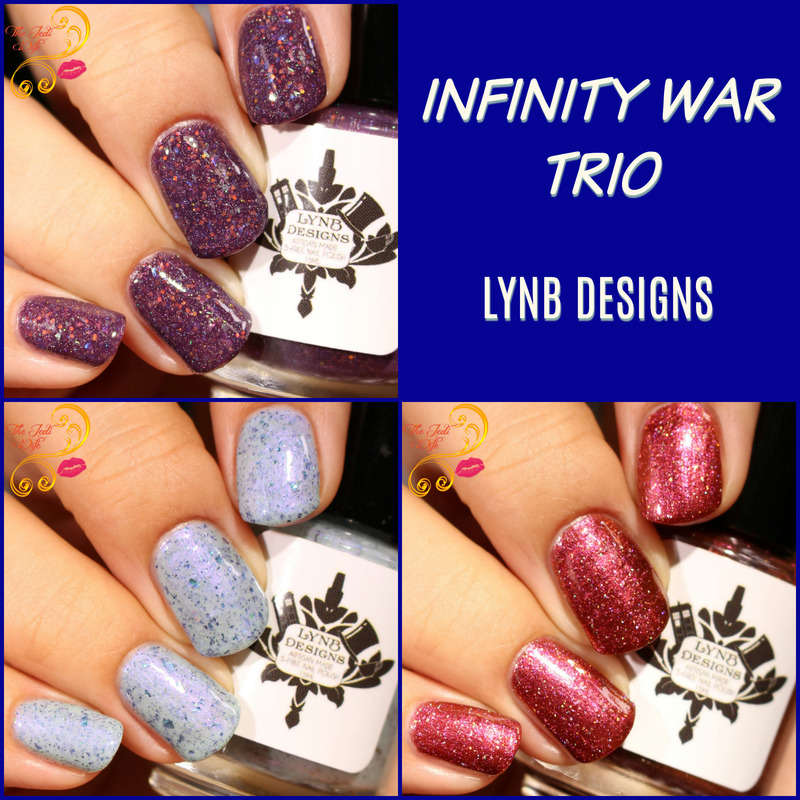 The Infinity War Trio will be launching on the LynB Designs website this Friday at 12 noon Eastern Time. The trio can be purchased for $36 or you can purchase individual polishes if you would prefer it that way. For the first week after the launch, you can save 50% off of these and any other shades ordered with the discount code FRANK. Are you planning to see the latest Avengers film in the theater? Which shade from the trio is your favorite? I'd love to hear from you! I would love to see the thermal effects of To Infinity. So cool. But I'm really loving Perfectly Balanced! Love love love Perfectly Balanced - it has so much shimmer in it that it basically glows! WOW! Yessss! These are so fun and great inspiration! I love it, I look forward to seeing the movie too! Perfectly Balanced is so unusual. I can't believe it's a light green base. What are UCC flakes though? To infinity is my favorite!!! These colors are super pretty! Im pumped to see the movie! What a beautiful trio! I love all of these. To Infinity really catches my eye! What a pretty trio! I love that they have a nice layered look. These are very pretty, my favorite is to infinity it's a unique shade.